The pigs have done a brilliant job of turning over their original field. So much so that we have to fence another two fields for them to work over. This field that they expertly rotavated with their snouts will be planted in the next couple of weeks with a pig grazing mix from Woodhead Seeds. It's a mix of cocksfoot, chicory, timothy grass, white clover and rye grass. A very good supplement to their diet. 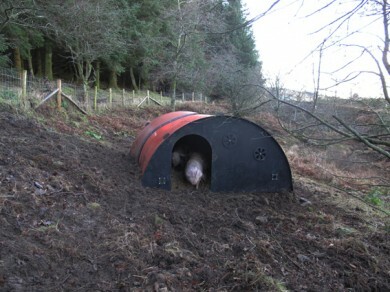 The original pig shelter, like a lean-to I made from corrugated iron, blew away one stormy night. It was patched up a bit but was never intended to be more than temporary accommodation for the piglets when they first arrived. They're quite hefty girls now and like nothing better than a good scratch-on so their poor shelter has taken quite a pummeling from their rear ends. We have now invested in a plastic pig ark which we got from Solway Recycling, a company that collects and recycles waste agricultural plastics and operates the National Farmers Recycling Service. 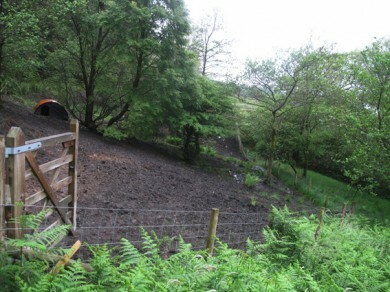 It's a robust shelter big enough for a sow and litter so is a good long-term investment for our Lawson Park Herd. I have been using dried reeds for their bedding which is just as good as straw and about quarter of the price (straw is about £8 a bale due to it being in short supply). So, they like the reeds and are now lovely and warm in their new house. It might seem like a bit of an unnecessary luxury but it has been proving a bit difficult to get our 'grower' pig to slaughter weight. Getting a pig to this weight is much quicker if they are kept warm and indoors but ours are burning off loads of energy running around their lovely field. We are also walking them every day to the paddy fields to act as natural rotivators for a grassy patch we want them to turn over so we can seed oats. They have also burning up energy to keep warm at night. Their new cosy home will mean they don't have to use so much energy so should help to fatten them a bit quicker. I measured them today to check their weight. There is a formula you can use if using an ordinary measuring tape which is girth (in cm) squared, times length, times 69.3, equals weight in kilograms. 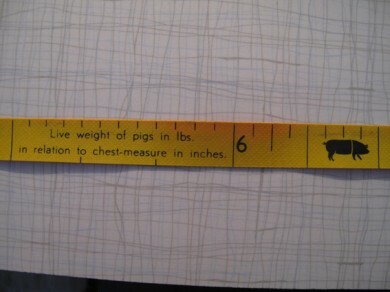 However, I used an animal measuring tape which if you measure their chest gives their weight in pounds. Ours are currently 128lbs (58 kilos) which is fine to slaughter out as a porker but a baconer needs to be taken up to about 80kg. Not sure if we will make this before Christmas. We'd ideally like to have our own meat to sell at the Coniston and Torver Farmer's Market and Art Fair we are organising for 11th and 12th December in the Consiton Institute. 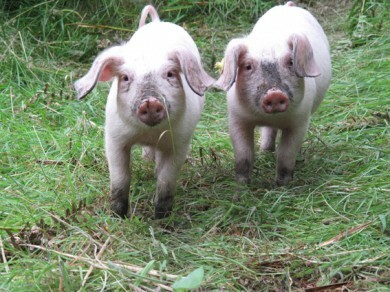 We bought a couple of weaners a few weeks ago, two very cute 2 month old British Lop pigs. Although they look like standard, everyday pigs they are the rarest of the six British rare breeds, but still very edible. One is for fattening up and one we will keep for breeding. Before they go their separate ways, they are loving their lush lodgings.